Solo albums are often a crapshoot for fans of a particular group. They tend to be ventures into bloated-ego territory; repositories of songs that just weren’t good enough to cut it on the parent group’s album. However, there’s a small but noteworthy percentage of solo albums that deepen your appreciation of what a musician brings to their day-job. Said solo outings might not venture too far from the sound a musician’s group is known for but the best ones allow you to approach that musician from a different angle that brings their particular talents into sharp focus. 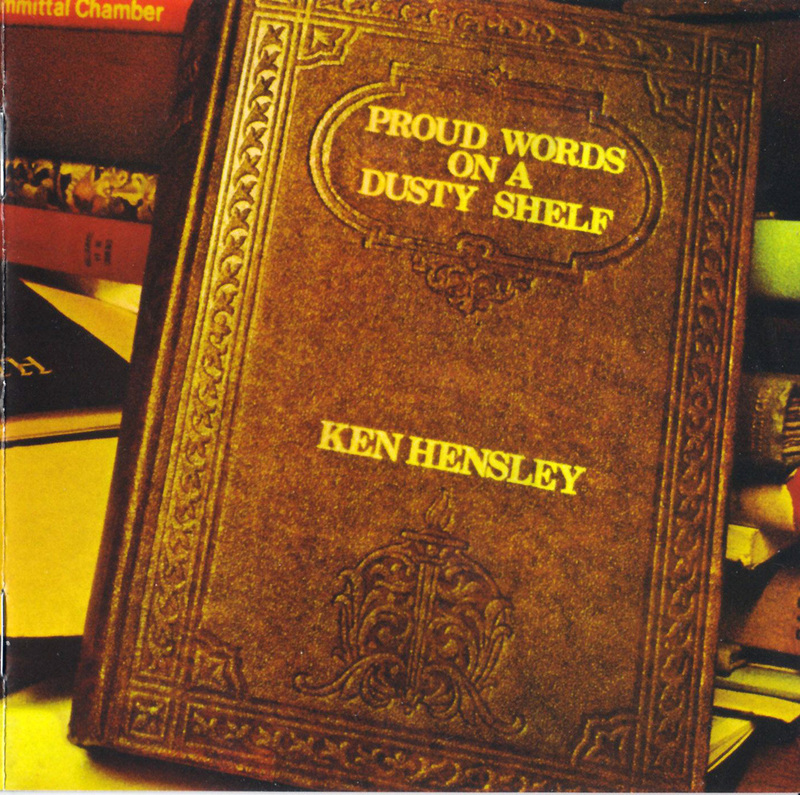 Ken Hensley’s Proud Words On A Dusty Shelf is a great example of that rarified brand of solo album. For those who don’t know the name, Hensley was the principal songwriter and keyboardist for the British hard-rock legacy Uriah Heep, as well as a frequent second guitarist and vocalist. They’re known for a highly theatrical, prog-tinged proto-metal that often embraces fantasy themes. This was Hensley’s solo debut, recorded concurrently with the group’s prolific output, and can easily be considered an extension of the group’s work because it features Heepsters Gary Thain on bass and Lee Kerslake in the drummer’s chair. That said, one shouldn’t expect a bunch of fire-breathing Frodo metal from Proud Words On A Dusty Shelf. Hensley delivers the occasional touch of heaviness here — album opener “When Evening Comes” is a steamy, wah-wah-drenched guitarfest and “Fortune” has the complex arrangement and multiple stylistic shifts that defined the best Heep moments — but rocking out is not what this album is about. The mood of these songs is introspective, using the guitar/organ alloys of their arrangements to convey intense emotion without lapsing into cliched hard rock moves. Instead, Hensley delivered an album that could be considered mellow-out music for the heavy rock fanbase. Some songs even have a country-rock sound (favorite in this vein: “Black Hearted Lady”). Balladry is the main style of songwriting here, with an emphasis on lyrics that deal in romantic loss and longing for the inspirations of a time gone by. Thankfully, Hensley has a way with a lyric that can be poetic and haunting: “Go Down” paints its character portrait of a lovelorn woman in a spare, elegant way that magnifies the quiet heartbreak of its words and “From Time To Time” steeps its tale of love lost in gothic, Brothers Grimm imagery. Proud Words On A Dusty Shelf further benefits from a high level of craftsmanship. Hensley was on a real creative high here, coming off a string of classic Uriah Heep albums that were anchored by his complex, richly melodic sense of songcraft. That style is fully on display here, in the arranging as well as the songwriting. Hensley handles all the keyboards and guitars (both electric and acoustic) and creates a musical backdrop that is richly detailed without lapsing into bombast. The rhythm section matches his every move in a sympathetic style, giving it all a three-dimensional quality. A great example is “Cold Autumn Sunday,” which starts with solo piano then bursts into a full band performance driven by fiery guitar leads before closing with a coda that blends both styles, adding choral vocals and organ for just the right touch of grandiosity. It also helps that Hensley’s vocals work hand in hand with the music to sell the lyrics. He sings in that classic English style of that early-1970’s era, elegant yet soulfully intense when needed. Throughout the album, he shows he can work a delicate croon (“Go Down”) or a strong, full-voiced delivery (“Cold Autumn Sunday”) with equal skill. If this wasn’t enough, he also did his own backing vocals and he shows an unerring knack for knowing when to add a double-tracked vocal or a backing chorus without overdoing either. Thus, Proud Words On A Dusty Shelf is a must for anyone interested in Uriah Heep and proof that Ken Hensley’s skills went beyond the group’s fantasy-oriented hard rock sound. Anyone interested should pick up the recent Esoteric Recordings remaster because it offers a skillful remastering job that preserves its earthy, analog textures. It also offers quality liner notes and a nice reproduction of the album’s lovely packaging in its booklet. It’s a nice treatment for a solo album that beats the solo-album odds. Excellent work by the author of the best Uriah Heep songs.